An inspection of the "Qezban" was carried out by the attended surveyor panel. Subsequently, the class surveyor and the Harbour Master requested to tow the vessel from Sevketiye anchorage to Yalova. The tug "Altug" has been appointed to tow the vessel. Upon completion of towage approval formalities, the towage operation had commenced on Jan 11. On Jan 14 at 11.15 a.m. the ferry berthed at the Sefine Shipyard. She left the yard again on March 23, bound to Tryla. She anchored in pos. 40° 44.20' N 029° 29.52' E on March 31 and remained stationary since. 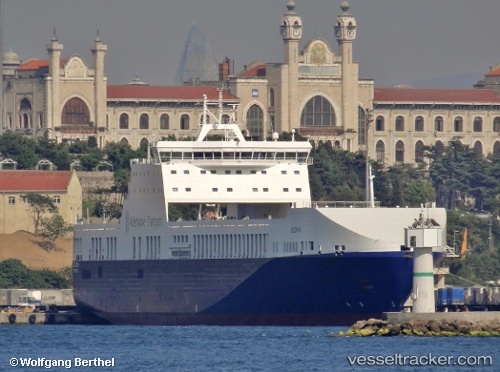 On Jan 10 the "Qezban" was towed to Sevketiye Anchorage at the northern entrance of the Canakkale Strait. Class and P&I surveyors were to attend on board to investigate the cause of incident and extent of the fire damage. A fine has been imposed due to a breach safe passage regulations in the strait. Further inspections were being carried out by surveyors.